However, as I always share with the questioners, MY situation is most likely much different then THEIR situation (and probably YOUR situation too). It might seem like I’m doing more than you or them, but really, I’m just doing different things. If you’ve ever wondered how on earth I’m able to work from home without sending my kids to daycare, I hope these 6 reasons help to clear up any confusion. I’m no “better” than any other working parent, I just have different skills and I’ve figured out a way to use those skills in a way that works best for me, for my personality, and for my family. 1. I am naturally organized, productive, and efficient. I have been organized, productive, and efficient for my entire life (way back to when I was a very little girl)… it’s how I’m naturally “programmed” to be, I guess. I never had to LEARN to be this way — I just WAS. Without even thinking about it, my brain naturally thinks of ways to better-organize whatever space I’m in, ways to be more productive with my time, and ways to create more efficiency in everything I do (seriously, even something simple like snapping beans or folding towels). I have always been good at juggling many different tasks and activities, as well as breaking down bigger projects into manageable chunks to reduce stress and alleviate that overwhelming feeling that sometimes arises when there is too much to do! Yes, there have been stressful periods of life for me — but for the most part, the fact that I am naturally organized, productive, and efficient is VERY helpful in my ability to manage working from home with raising my children and everything else I do each day. 2. Dave’s schedule is accommodating and his personality is supportive. We know many families where one or both parents don’t get home from work until 5:30, 6:00, or sometimes even later. Then they still need to pick up the kids from daycare, make supper, try to get in a little quality time with their kids, and then get everyone to bed. 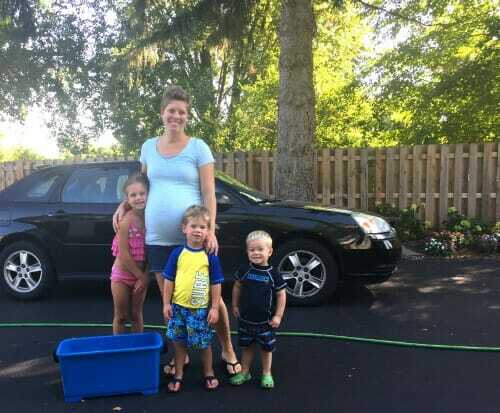 Once the kids are in bed, they still need to do all the “normal” household stuff they couldn’t do during the day while they were at work — laundry, dishes, grocery shopping, other errands, etc. There’s no way they could have time for anything else on the side. So the fact that Dave is almost always home by 3:30 every afternoon means our kids get to see him A LOT, we can eat dinner really early (usually by 4:45), we can spend a little quality family time together after dinner, and still have our kids soundly sleeping by 7:00pm — often earlier! Plus, Dave is home all summer and he has really scaled back on the number of “extra” school activities he participates in — all in an effort to be home more often (which is super helpful for me). Dave has always been very interested in, and supportive of, my blog and VA work (even way back when I wasn’t making any money), and he’s great about reading through all my posts before they go live to (hopefully) catch most of the typos! Without his supportive personality and accommodating schedule, it would be very difficult for me to work from home with kids. 3. I worked from home BEFORE kids. I’ll be honest, the thought of STARTING a business (or really anything big) with multiple young children at home with me all day is pretty much unfathomable for me right now. 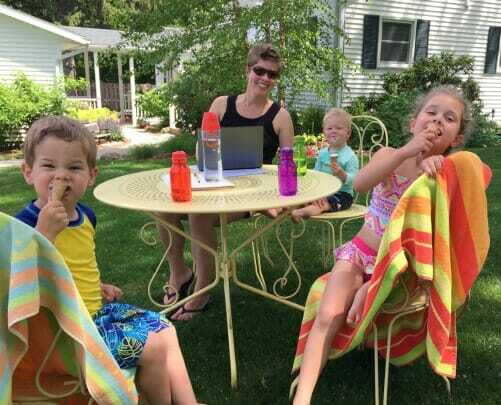 I know plenty of parents who have done it successfully; but for me, one of the keys to working from home with kids is the fact that I had my “work routine” in place before kids were ever in the picture. Of course, I’ve had to make several tweaks and changes to my routine as we’ve added more children to our family (see #4 below), but the bulk of the work was already finished before children entered our lives, making it easier for me to focus more on my family while my business now moves along in maintenance mode. 4. I’ve scaled back on my workload as our family has grown. When I had Nora, I felt 100% confident I would be able to continue doing everything I did before she was born… and maybe if she hadn’t been such a fussy baby, I would have come close. However, it only took a month or two before I realized I would have to drastically change my work, social, volunteer, and extracurricular lifestyle if I wanted to maintain some shred of my sanity. Thankfully, over the past 5+ years, I have diligently worked to simplify and streamline every aspect of my life — from my blog, email, and VA work, to my volunteer opportunities, meal planning, and my strategies to keep our house “clean enough”. I went from publishing 6-8 posts per week to 5 posts per week. I quit 3 of my smaller virtual assistant jobs. I quit reading most other blogs. I do almost ZERO social media — just a handful of Facebook posts per week because I enjoy interacting on Facebook. I don’t send out any email marketing — just the daily post email that goes out automatically to anyone who subscribes, which requires no effort on my part. I have turned down 3 book offers. As I mentioned above, Dave has really scaled back too — he went from coaching 3 sports and being SUPER involved in so many aspects of school life to no coaching and, essentially, no extra curricular activities at all. We both know this is just a season of life for us — and we both hope to eventually add a few more things to our plates once our children are older, but for now, we are happy to enjoy less busyness and less stress. 5. All of my at-home work is flexible. I have been offered SO many different work-from-home opportunities over the years, but I’ve turned almost all of them down because they have strict hours, important deadlines, or require lots of time-sensitive work. I’m sorry, but with multiple little children around all day, there is NO WAY I could ever commit to having certain pieces of work done by a specific time each day or each week — and I certainly can’t set aside multiple hours in the middle of the day for a conference call, video chat, or group project. That’s just not realistic for me right now. So I only accept job opportunities that are VERY flexible, with tasks I can complete in my own time, after the kids are in bed, when they’re playing with Dave, etc. etc. Yes, this means less over-all income for me, but one of the main reasons I enjoy working from home so much is that I can work it around MY LIFE. I can throw in a load of laundry, put dinner in the slow cooker, and take my kids to the park for the morning… and then tackle my to-do list once Dave is home or once the kids are sleeping. Without this flexibility, working from home with kids definitely would NOT work for me! 6. I LOVE being home! When Dave and I were first married, I was convinced I would keep working full-time outside the home even after we eventually had children. However, only a couple years into our marriage, I discovered how much I just LOVED working from home, and generally being home all the time. After Nora was born, it felt so natural for me to be at home with her (even though I NEVER pictured myself as a stay-at-home-mom). I’m so thankful everything worked out for me to be home with her, considering she refused to eat when I wasn’t around! I can’t even imagine the amount of stress and “mom guilt” I would have leaving her every day, knowing she would eat little to nothing while I was gone. Without any one of these pieces to my puzzle, it would most likely be VERY difficult and VERY stressful for me to work consistently from home with young children at home. However, based on my lifestyle, my personality, Dave’s schedule, and Dave’s personality, working from home doing the jobs I do seems to be the perfect fit for me and for our family right now. I’m completely aware that this could all change at any time — but for now, working from home with kids definitely seems to work for me! Before children, I believe you said you earned a “full time” amount of pay. Since you have scaled back, would you say you earn 60%………….or 75%………….or what percent of a “full-time” pay do you earn? If you say 100%, then I officially declare you Super Woman! well, part of my goal was to earn passive income through advertising, so I probably make about 80% of what i used to make with only 40% of the effort and time… not too bad! Congratulations for the baby!! Welcome Clara Jo!! She is beautiful!! When I was on maternity leave from my corporate job with kid1, I knew I didn’t really want to go back, because of the time commitment, and long hours (part of my job was event planning and execution, and needing to be at all of the events which were mostly evening and weekend). I was looking for things I could do part time. My husband mentioned to a friend of his that I was hoping for something I could do from home – and as it turns out, his now wife was working for a small business, who was looking to bring someone on part time. Their needs fit my skill set, and I’ve been working there for over 5 years. While my roll has shifted over that time, I love that my particular roll can primarily be accomplished outside of primary business hours. So, I can be a SAHM to my young kids, and still have the satisfaction (and financial) benefits of working. My youngest will be starting preschool next year, and I’ve already talked to the owner about going full time when he does. It would still be from home, but again allow me the flexibility to be mom as needed – I love that I can chaperone school field trips, or take them to the zoo on a day off, and not worry about work, as I can fit it in to my schedule. My husband is super supportive, and if I have a deadline I really need to meet, he’s great about giving me time once he gets home from work or on the weekends to make that happen. I feel like I have far more work life balance with this job (even when I go full time) than I would’ve if I had returned to my corporate job. this is so great! glad you found an at-home job that works for you! Thanks for the great post, and I see congrats are in order on your little beautiful bundle!!! I’ll go second! Still no baby??? I love this! I work from home, too, and I have many friends who say “I could never do that.” And they’re right–it’s not for everyone. Since you and I have pretty much the exact same personalities (LOL! ), it works for me for all the same reasons it works for you. I am organized and disciplined, I have a supportive schedule and family, and I LOVE to just be home. My boss (I am the practice manager for an OT practice) knows that the work will get done well and on time and doesn’t micro manage me at all. In fact, we recently moved seven hours away from the office location, and all I had to do was get my home office set up in our new home! My boss’ exact words to me when I told him we were moving “I don’t care if you move to Nigeria, you can work for me!” Like almost everything in life (with a few obvious non-negotiables!) it doesn’t work for everyone, nor does it have to! But I wouldn’t have it any other way and am so grateful for the blessing of working from home. Jen- Your job sounds like my dream job! If your company ever has a need for another work from home position (FT or PT) please keep me in mind! I have been looking for a similar situation that still utilizes my OT background (I’m a COTA), and my organizational skills, but can be done from home. that’s great — i could never handle a micro-managing boss either! Ok, I will go first, still no baby?